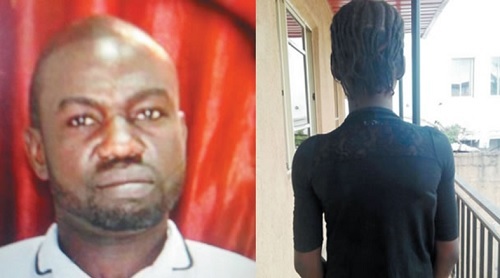 A 12-year-old girl, identified simply as Jennifer, whose parents shared the same compound with a dry cleaner and his wife in the Shasha area of Akowonjo in Lagos, has made a shocking revelation on how she endured consistent sexual harassment in the hands of the man she called Uncle Paul. According to a report by Punch Metro, the 40-year-old Paul Onobluduakpo, allegedly insisted on sleeping with the girl, until the harassment became unbearable for her and she broke her silence. According to her, after many previous actions like smacking her bottom and pinching her body parts, Paul took his harassment further one day when she was dressing up in the room. “I did not know he was at the door and watching me as I was dressing up for church. He opened the net on the door. His wife was around. So that she would think he was just playing with me, he called out to his wife and told her ‘Come and see this small girl wearing bra o’. I was angry. “Then, his wife came to meet me and advised that I should stop wearing bra at a young age. His wife did not know what was going on. I drew the curtain to dress up again and I saw him still peeping. I then shouted ‘Leave that place’ so that his wife would hear. The latest events happened after Jennifer, a year one secondary school pupil, started holiday and was at home with her 10-year-old sister. According to Jennifer, her mother was away at work while her father works outside Lagos. She said, “That day, I was in the room when he just came in and started saying, ‘Do you know I love you? He was trying to hold me and I told him I would shout. I told him to go and love his wife and children. “He said, ‘You are my wife too’ and I said ‘God forbid.’ He suddenly grabbed me and put his finger inside my pant and I ran out of the room. When he heard my sister’s footstep, he walked away to his room. Jennifer’s mother said he wanted him to be caught red-handed so, she did not confront him when her daughter reported the consistent harassment she had been suffering in the hands of their neighbour. As expected, few days after that, Jennifer said she was playing with her siblings in the compound when Onobluduakpo again smacked her bottom. The girl went straight to report to one of their neighbours and went inside. “As I was entering our apartment, he followed me and I slammed the door again against him before he could enter. He was angry,” she said. Jennifer’s mother told a correspondent that she reported the case to the Esther Child Rights Foundation immediately she heard of Paul’s latest action. “My daughter said that once in a while, Onobluduakpo gave her N100 just so she would not reject him when he intended to perpetrate his evil intention. I restrained myself from confronting him because I did not want him to run away. The most annoying part was that my daughter said the man also once touched the breast of her 10-year-old sister." Onobluduakpo was eventually arrested and detained at the Shasha Police Division, Lagos on Tuesday. Officials at the station said he was arraigned on Thursday at an Ogba Magistrate’s Court on charges of attempted defilement and sexual abuse. Onobluduakpo pleaded not guilty as the charge was read to him. He was later granted bail in the sum of N300,000 with two sureties in like sum.